How the search engines can generate more business for you. Examples of how the search marketing working in private practice. The difference between SEO, Pay-per-click Ads, and local listings. Why you should SEO your website. How E-rehab can help you. How long does it take for my ads to show up? What will my ads say? What will you be doing to my website? How much does your search marketing service cost? Can I have the SEO without the pay-per-click ads? Can I have the pay-per-click ads without the SEO? What if I just want the local ads? We should start off by stating this most important premise. The objective of search marketing is to drive more people to your website, period. The more traffic your website experiences, the more likely you are to generate new business. In 2006 there were over 135 million searches for health information according to the PEW Internet research group. "Dr. Google" is the de facto second opinion with 2 out of 3 web searches starting at the search engines. The physical therapy profession, in many cases, is the best choice to treat these pains. In summary, a large percentage of people suffer from musculoskeletal related pain. Millions are going online looking for answers to these health problems. They start with search engines to find the answers, so you need to be positioned (on the search engines) to drive them to your website where they can learn how you will solve their problems. Case studies of how the search engines work for you. This begs the question, "do private practices really get more business with search engine marketing?" The answer is YES! Now, the results may vary from community to community, but if your practice is in a metro or suburban area, where up to 70 percent of the community is online, the chances are that people will search for you way before they open the yellowbooks. "My return on investment is 10x that of my yellowbook ads," says Rodger Henning, PT of Henning and Cole Physical Therapy. Bottom line, if you are not listed with the search engines and coming up at the top of the page, you are probably losing business. The difference between Natural, Pay-per-click Ads, and Local Listings. SEO or search engine optimization is the process of improving the volume and quality of traffic to your web site from search engines via "natural" or "organic" search results (see above for the natural listings). SEO is a global competition. You are competing against every other website in cyberspace. For this reason it can be very challenging to get your website to rank at or near the top of the page for certain search terms. Pay-per-click ads are the ads you see in the right-hand column of the search results page (see above). You the advertiser, bid on "keywords" that you believe your target market (people they think would be interested in their offer) would type in the search bar when they are looking for your type of rehabilitation service. When someone clicks on your ad, you pay Google or Yahoo! (the two top Pay-per-click search engines) the given bid amount. The pay-per-click fee can range from 10 cents to 10 dollars or more. For rehabilitation related terms the prices are typically twenty-five cents to a dollar per click. The local listings are the listings that appear at the top left of a search results page. They only appear when someone does a search with geographic search phrases. Our example above, where the search phrase is "physical therapy encinitas ca" is a good example. The reason you want to search engine optimize your website is so that you will come up at or near the top of the search engine results page when someone searches for your practice or search phrases that pertain to your practice. Studies suggest that people look at the natural results first. Take a look at this heat map. 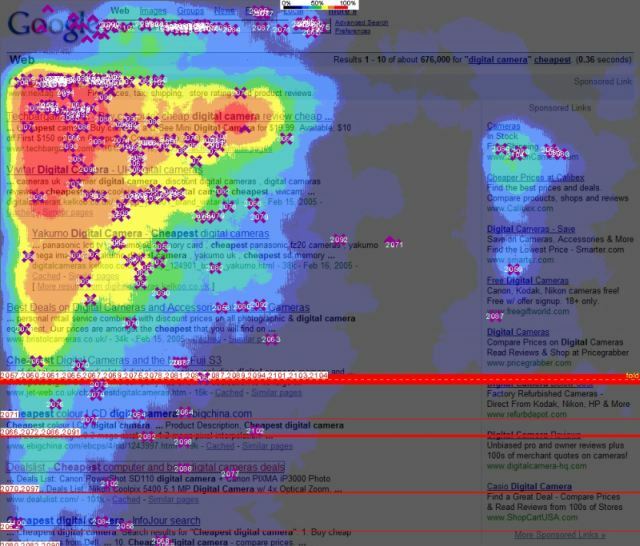 The "hotter" areas are where people fix their eyes on the page. As you can see, people tend to look at the natural results region of the results page. The cost to optimize your website is a fixed cost. Very simply stated, you pay the setup fee and the monthly fee and your costs do not increase whether one person clicks on your search link or 1 million click on your search link. If you optimize your website, this process is going to help your website show up on a large number of websites, not just Google and Yahoo!. There are five main advantages to using the Pay-per-click advertising opportunity. Your website will show up when someone types in a broad search phrase like "physical therapy". Specific Advertising Phrases can be displayed in response to a specific search phrase. For example, if someone typed in the search phrase "physical therapy and low back pain", the ad you might display is "Physical therapy helps low back pain". You cannot easily accomplish this goal with SEO. You can almost guarantee that your advertisement will show up if you bid enough money. With SEO, there are no guarantees and the results can change on a search-by-search basis. You can set a finite budget. You can setup your account so that you only pay $50.00 per month with pay-per-click ads. This makes budgeting and accounting easier. You can have your ads display in a local radius around your practice. This is a huge advantage. You can limit the people that will see your ad which limits your financial risk. There are three main reasons why you want to show up in the local listings. If someone does a search with a geographic search phrase, they are the first listings that show up. Local listing are often incomplete. By properly entering the correct business information, you increase your chances of someone visiting your website. Local listings are usually tied to a search map such as Google maps or Yahoo! maps. This provides the viewer with quick visual results as to where your clinic is located in relation to their residence/business and can increase the likelihood that they will choose your practice. As with our websites and marketing services, there are five great reasons why you should choose E-rehab for your search marketing needs. We put you, the client, at the top of our list. We pride ourselves on providing you the best customer service possible. We understand the importance of value and the fact that you don't have much time. We want to earn your trust and be your partner in the success of your private practice. We're just darn good guys and gals and fun to work with! David Straight, PT is a physical therapist, was the owner/partner of a private practice and therefore, knows the private practice industry. John Mason is a search engine marketing expert. He is Yahoo! Search Marketing certified and has spent hundreds of hours researching and developing the best systems for search engine marketing. We will save you time and money. Our services are competitively priced with other search marketing services. Monthly reports of performance provided. Pay-per-click ads will show up within the 30 days of the receipt of your setup fee. Local listings will be added/updated within 30 days of the receipt of your setup fee. Natural listing could take anywhere from 6 to 12 weeks to show up. What your ad will say in the natural listing usually comes from the first paragraph of your home page text or meta data tag content. For the sponsored ads, one set will include your practice in the case of people searching for your practice by name, and the other will state that you are a PT provider with a geography tag. All kinds of changes many of which will be behind the scenes in the code. We will also be adding text to your website that will help your website rank higher in the search engines. Our complete search marketing solution costs our existing customers $299 setup fee and $99/month. Can I have the SEO without the sponsored ads? Yes. The cost is $220 and $49/month. Can I have the sponsored ads without the SEO? This you can do on your own. Ask us for the links. There are no contracts but we highly recommend that you use this service for at least 9 months to get your site listed, improve the rankings, and also get a better measure of the results you will obtain from this advertising effort. Anything less is likely to be a waste of money. In addition to our fees, you will have to pay Google and Yahoo the pay-per-click fees. We recommend that you set a budget of $50/month for each. Search Engine Marketing - this describes the process of utilizing a variety of search engine functions to drive traffic to your website. The most important search engine functions that will accomplish the goal of driving traffic to your website are SEO, Pay-per-Click, and Local Listings. SEO or Search Engine Optimization - SEO is the process of improving the volume and quality of traffic to a web site from search engines via "natural" or "organic" search results. Pay-per-Click - Advertisers bid on "keywords" that they believe their target market (people they think would be interested in their offer) would type in the search bar when they are looking for their type of product or service. For example, if an advertiser sells red widgets, he/she would bid on the keyword "red widgets", hoping a user would type those words in the search bar, see their ad, click on it and buy. These ads are called "sponsored links" or "sponsored ads" and appear next to and sometimes above the natural or organic results on the page. The advertiser pays only when the user clicks on the ad. Local Listings - local search is a query that uses a special type of search engine. The query includes not only information about "what" the site visitor is searching for (such as keywords, a business category, or the name of a consumer product) but also "where" information, such as a street address, city name, postal code, or geographic coordinates like latitude and longitude. These sites are primarily supported by advertising, but some accept payments from retail merchants and others wishing to be listed. Search Engine - is an information retrieval system designed to help find information stored on a computer system, such as on the World Wide Web. There are three major search engine companies that dominate the market - Google, Yahoo!, and Microsoft's Live.com. Search Phrase - search phrases are the combinations of words (sometimes called keywords) of interest that a search engine user types into the search field on a search engine website like Google or Yahoo!. Keyword - a keyword is one of the words used to find matching web pages. It was popularized during the early days of search engine development, as it was not possible to ask natural language questions and find the desired sites. Searches gave the best results if only a few keywords were chosen and searched for. These "keywords" captured the essence of the topic in question and were likely to be present on all sites listed by the search engine. © E-rehab, LLC. All rights reserved.